IROCKU is extending our online music lessons to include rock, jazz, pop and blues instruction for piano, guitar, bass, drums, voice, and sax. If you are a music teacher or if you know of a music teacher who is interested in connecting with new students via Chuck Leavell’s website, www.irocku.com, for online music lessons please let us know. Please fill out our music teacher registration form or send us an email to onlinelessons@irocku.com. For our live online lessons, we encourage teachers to follow a methodology that works best for them. We don’t require teachers to follow our irocku methodology for the live online music lessons. Teachers can choose to use lesson content of their own or the irocku lesson content. We prefer that instructors teach in a manner that is best suited for them and to constantly innovate and explore new teaching approaches. In most cases, students are interested in learning particular songs that we have not posted on our website so one-on-one private lessons work best. We have found that it is helpful if our students and teachers communicate with one another prior to each lesson to share ideas on what the student wants to work on during the lesson. This also gives the teacher a heads up on what he/she might want to prepare for the lesson. We schedule lessons in blocks of 45 minutes and 60 minutes with the hourly lessons by far the most popular. Students and teachers can choose whichever video chat apps they are most comfortable with for the lessons. So far the most popular app has been Skype, but students and teachers also use Facebook Messenger, Apple Facetime, Google Duo, WhatsApp and Google Hangouts. International students and teachers tend to prefer WhatsApp. If you are unfamiliar with any of these apps no worries, we’ll help you get things set up. We provide certifications for teachers who want to be ‘irocku’ certified. Teachers will receive an irocku certificate signed by Chuck Leavell, an irocku certification emblem will accompany their bio on the irocku website, and their students will receive special discounted prices for the irocku recorded lesson content. Send us an email to teachercertification@irocku.com to learn more about becoming a certified teacher. Each IROCKU lesson is presented in 7 different levels. Beginners start with levels 1-3, intermediate players hone their skills with levels 3-5 and advanced players challenge themselves to play rock’s greatest licks with levels 5-7. Each video lesson includes an arrangement of the song, an exercise similar to Hanon or Czerny that focuses on either a theory or technical exercise related to the song, an improvisation lesson that covers the chords, riffs, and scales used to improvise over the progression, and a groove chart that includes the chord progressions and rhythms used to comp with a band. 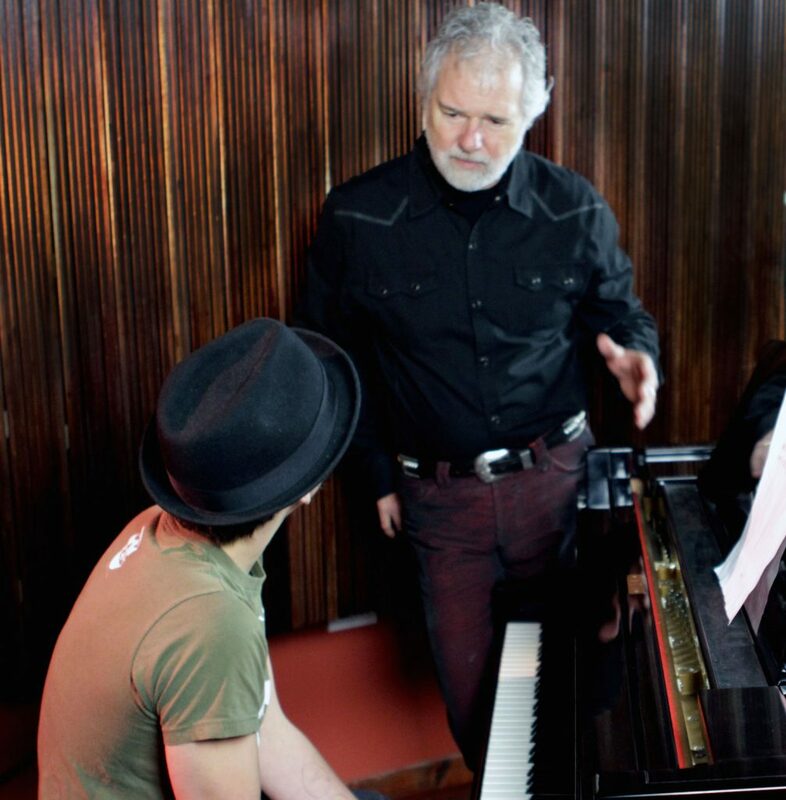 IROCKU was founded by Chuck Leavell, recipient of the 2012 Grammy Lifetime Achievement Award and legendary keyboardist for the Rolling Stones, The Allman Brothers, and Eric Clapton. IROCKU’s mission is to provide the best contemporary music education on the planet, for beginners through advanced players. We are the top destination for rock piano lessons on the web. We provide online video lessons, live online music lessons, and custom transcriptions.